A few years ago a friend and I snagged a cooking lesson from an olive oil store through Groupon. It was through a store called the Oilerie and it showcased oregano infused olive oil. I wish it was on Groupon again because it was so much fun and the recipes were amazing! Although we made a dessert and chimichurri bread, I'm just sharing the steak recipe for now. 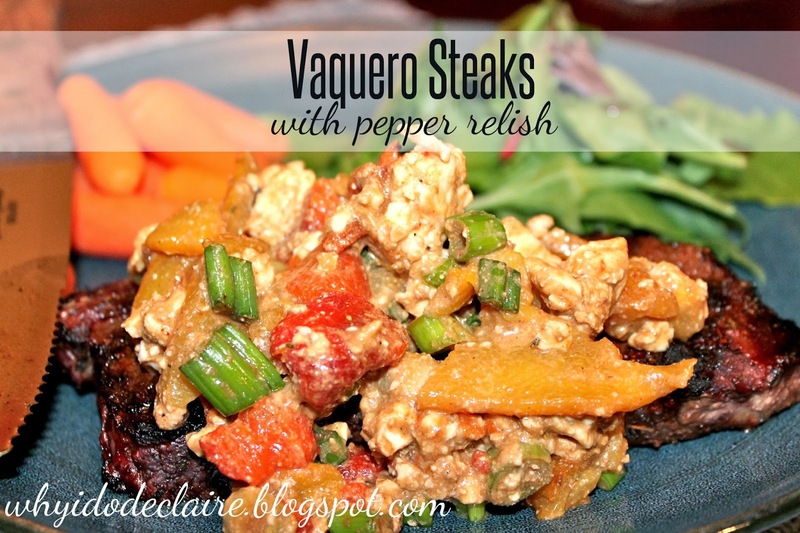 It's absolutely delicious and the pepper relish compliments it perfectly! I love how pretty all the colors look in the relish. Yes, I like my food to look pretty. I think it makes it taste better! 1/4t. sugar, 1/2T. olive oil, 1 each of red and yellow peppers, 1/4c. sliced green onions, and 1/3c. crumbled feta or goat cheese. Oh, and 2 New York strip or tri-tip steaks, about 4oz each (My husband bought the steaks so of course they are bigger than 4oz each). 2. To roast peppers, place on hot grill or gas burner and char the peppers. Place them in a plastic bag when the skin has been blackened and seal. Let sit for a few minutes. The steam will help roast the peppers. After a few minutes steaming, the skin should peel off. Or you can use a spoon to kind of scrap the skin off. Chop the peppers and set aside. 3. Combine steak seasonings together in a bowl with sugar. Set aside 1/4t. seasoning. Rub steaks with seasoning. 4. Whisk together vinegar, mustard, sugar, and reserved spice in a medium-large bowl. Drizzle olive oil and whisk until completely blended. 5. Add chopped peppers, sliced green onions, and feta. We altered the recipe so there was additional relish because we love it so much. The recipe originally called for just a half a pepper each, but I didn't like to waste the other half so I added more green onions and feta to balance it all out. There was enough of the liquid so I didn't increase that. You could also use goat cheese in place of feta, but I find the taste too strong for my liking. We also had to use balsamic vinegar this time because we ran out of the red wine. I like the red wine vinegar better because it doesn't tint the relish brown like balsamic. Either vinegar is tasty though. 6. Grill steaks 4-5 minutes on each side until desired doneness is reached. Let rest for 5 minutes before serving. Top with pepper relish. 1. To roast peppers, place on hot grill or gas burner and char the peppers. Place them in a plastic bag when the skin has been blackened and seal. Let sit for a few minutes. The steam will help roast the peppers. 2. Combine steak seasonings together in a bowl with sugar. Set aside 1/4t. seasoning. 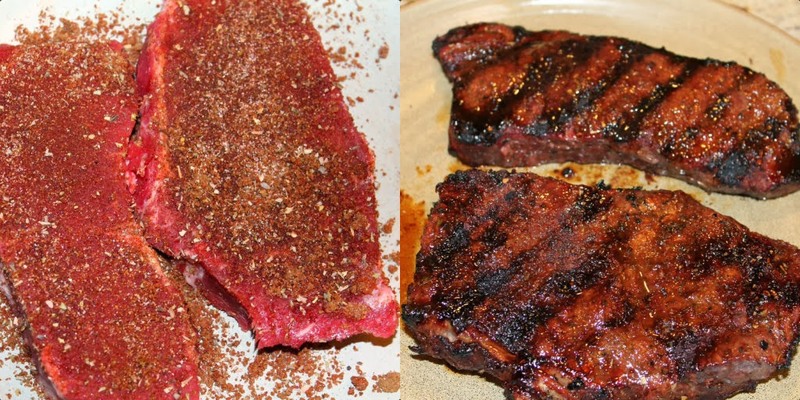 Rub steaks with seasoning. 3. Whisk together vinegar, mustard, sugar, and reserved spice in a medium-large bowl. Drizzle olive oil and whisk until completely blended. 4. Take the peppers out of the bag and scrape off blackened skin with a spoon to peel. Chop peppers, taking care to remove all seeds. Add peppers, green onions, and feta to vinegar mixture and mix. 5. Grill steaks 4-5 minutes on each side or longer for preferred doneness. Let rest for 5 minutes once steak has been removed from heat. Serve topped with pepper relish. Yum! I'll have to show this eclipse to Brain so we can make it. Thanks for sharing this recipe. I alway love trying new ones out. taking a cooking class sounds like fun - especially since you get a yummy meal to eat at the end! Of course you are important! ;) We need to do something like that again!